Home›Reviews›Guitar and Equipment Reviews›Guitar Amp Equipment Reviews›Fuchs Mantis Jr.
Fuchs Audio Technology fits that description to the letter. Please take note, nowhere in the definition is there mention of “breaks the bank.” Andy Fuchs, the man behind the name that adorns Fuchs amps, was gracious enough to send us a Mantis Jr. for our review. Andy, always the tinkerer, has in recent years refined his amp designs to offer an affordable, lower watt solution with the flexibility to play a wide variety of gigs and sessions. 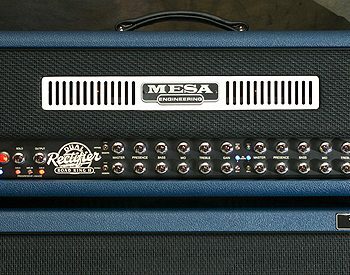 Built off of his popular Casino series chassis, the Mantis Jr. is a Twenty Watt, two-channel head with a dedicated boost circuit. Driving the preamp section are three 12ax7 tubes, while the power section uses two 6v6 tubes. The amp is built on an aluminum chassis, and given the custom Heyboer transformers, the amp is surprisingly light in weight. Channel 1 was designed to provide a classic brown type of sound, while channel 2 starts in the brown territory and “amps it up” to face melting, high gain. 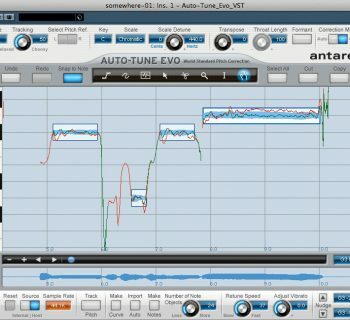 The two channels share an EQ section consisting of Presence, Bass, Middle and Treble knobs. What is more unique, though, is a Thrust knob, which is used to control the low frequency response of the amp via its output stage. The amp’s independent Master Volume and Gain knobs are always a welcome sight. An On/Off toggle and an input jack round off the front of the amp, along with the Fuchs name on the grill. The back of the amp is laid out intelligently, giving us a quarter-inch footswitch jack (for the included footswitch) and another jack for the series effects loop. The send and return for the loop requires use of a single TRS to dual TS cable, familiar to users of recording gear, though not the most common design for guitar amps. Return level is fixed. The speaker jack section is marked for 4-, 8- and 16-ohm speakers with three independent jacks. However, there is a warning to use only one jack at a time, so connecting two cabinets is not possible (at least not from the output of the head). Standard AC power input as well as a standby toggle and a fuse finish up the back of the head. 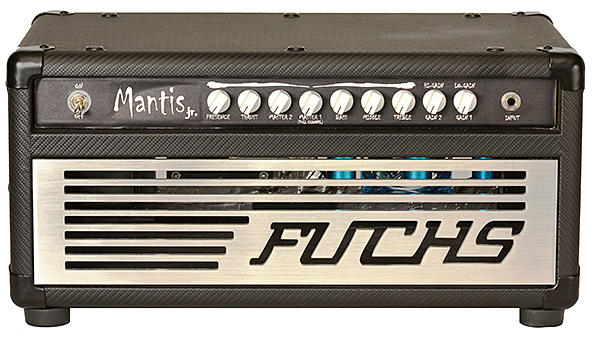 We fired up our Fuchs Mantis Jr. head as soon as we got it unboxed. Connecting the footswitch was simple thanks to its quarter-inch TRS cable. The Fuchs-branded footswitch had two separate buttons on it for Channel and Boost, with bright indicator lights on each. The footswitch was hard wired to the cable, though, so if the cable goes bad, you’ll to send the footswitch in for repair. Fortunately, we have a boxful of generic, two-button, TRS footswitches that could be put to use (or you can easily interface with your favorite amp switching products). The Fuchs Mantis Jr. was particularly light weight for a tube amp, and provided a welcomed break from transporting our 100W heads to rehearsals and gigs. We had a fairly easy time volume matching the two channels with their independent Gain and Master Volume knobs. The effects loop worked satisfactorily, however requiring use of a single-TRS-to-dual-TS cable was particularly annoying. The loop is exclusively line level, so you’ll need a third-party solution if you’re planning on using instrument-level pedals in this fashion. We would prefer to have some control over the loop levels on the amp, but that would of course increase its complexity (and cost). The boost feature is available to both channels, and fortunately, we happened to like the boost level that was pre-set at the Fuchs factory (naturally this is something else we would prefer to have control over). After setting the amp up with our Mesa/Boogie Rectifier 4x12 cabinet, we plugged in our Fender American Standard Premium Ash Telecaster and checked out Channel 1 with no boost. The channel was clean, but unless the gain was near zero, there was always a hint of dirt. We were able to achieve clean tones, but only in this fashion on the clean channel, and only with this particular guitar. Any nudge of the gain knob from near zero introduced grit into the sound, albeit favorable grit. Any use of humbuckers, even ones with moderate output, also produced a little hair on the sound. The Middle tone knob we found to be our favorite. Any position past twelve o’clock yielded great results. We could not dial in too much low end, and were unable to get the amp to sound flubby—a welcome change from the amp that usually pairs with this speaker cabinet. The Thrust knob worked in two ways. It acted like a bass presence knob as well as a sag feature. All the way to the left, we felt tighter bass with faster attack. 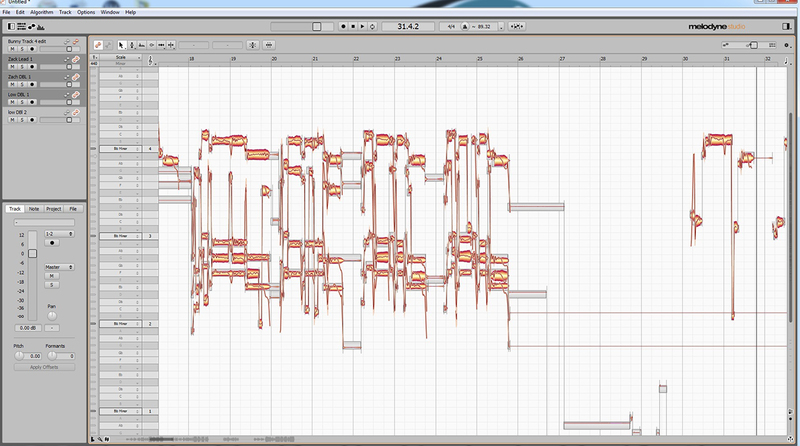 The bass tones became more prominent as the attack slowed as we turned the knob to the right. Throughout the sweep of this knob, the amp always remained musical. Applying the boost to this channel, our Tele got instantly louder and throatier. The boost did change the tone of the amp, so to our ears it sounded more like a tame overdrive with the level set high in front of the amp. The amp tone changed, but we liked how it changed. Clean chords were not possible with the boost engaged, but our double stops and single note lines became more prominent and had more character to them. We then plugged in our Knaggs Kenai and explored the high-gain channel. With the volume matched and the boost off, the amp was noticeably spongier and had much more usable gain on tap. With our guitar loaded up with Seymour Duncan SH-1 pickups, the amp started to give up some good compression and saturation which our Tele’s single coils did not achieve previously. We found our favorite setting had the gain at around 5:00, the thrust about 7:00, and tone knobs wherever desired. The sound was punchy, well represented in the frequency spectrum, and beefy enough for most modern rock or metal applications. Switching on the boost circuit in this setting gave us much more amp saturation and allowed for almost instant feedback. We needed to take several steps back! The bump in volume with the boost was, again, significant, and the high-gain channel got downright rude. Solos, fretboard tapping and legato lines became effortless. We would have really liked a touch of reverb in this amp, so we dialed some in with our TC Electronics G-System in the effects loop. Perfect. Our last sound test involved taking the amp out with our band. Being an ‘80s tribute band, we were interested to see if we could make this shredder’s amp reflect the tones needed. To mix it up even more, we performed this test with a Fender Johnny Marr Signature Mustang (cool guitar—review coming soon). Talk about a sonic platypus! We felt the amp performed well, and twenty watts was perfectly loud enough, with headroom to spare. This guitar’s Bare Knuckle single-coil pickups drove the amp better than our Telecaster’s stock Fender pickups, and the results were positive. Our chords sustained wonderfully, and the overtones were rich and pleasurable to the ear. We liked this combination best when we dialed down the second channel’s gain to around 8:00. Playing a little more with the Jaguar, we were able to almost duplicate Channel 1’s sound with the boost engaged, on Channel 2 with no boost. It became apparent this amp delivers more than just a tone or two, and it definitely possesses enough variety of tone to make many players happy for a long time. 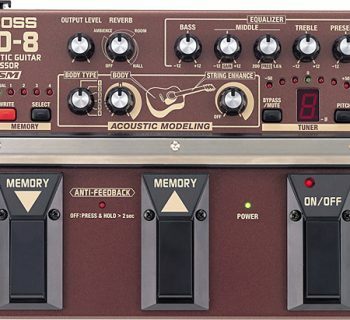 The manual adequately explains the functions of the amp, as well as goes into how important it is to assure a load is connected at all times while the amp is powered on. The TRS loop is also explained well. The small team at Fuchs respond quickly to email questions, sometimes even the man himself! Andy Fuchs is also receptive to visits to the factory and showroom if you’re in the Clifton, New Jersey area. They just ask you call ahead. A healthy five-year warranty comes with all Fuchs amps, and 90-day coverage on tubes. Fuchs is a boutique shop, so if you want any custom amp work done, just talk with them about it. The Fuchs Mantis Jr. sells for $1,695, which is a good value thanks in part to the great second channel, as well as the inclusion of a boost circuit and effects loop.